While Deutsche Bank may have a far greater headache now that it has been implicated as an accomplice in Danske Bank's giant money-laundering efforts, helping some $150 billion in funds transit out of Europe illicitly, in an amusing tangent showing how the biggest, and most troubled, German lender can seemingly get nothing right these days, the most troubled German lender had put on a hedge to minimize risk at its U.S. equities business. Instead, the company lost tens of millions on the trade. According to Bloomberg, Deutsche Bank's New York traders pooled billions of dollars of positions into one portfolio, known as a central risk book, in an attempt to avert losses and potentially make more money (or maybe in hopes of recreating JPM's London Whale "hedging" behemoth). 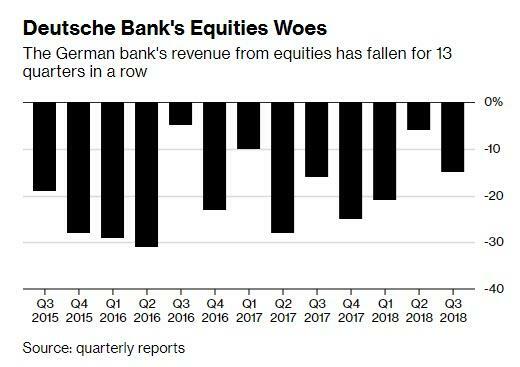 Alas, it did not work out quite as expected, and the trade backfired leading to a $60 million loss, and forcing Deutsche Bank to slash the book’s size. A reversal of the "pod" or silo strategy popularized by such hedge funds as Millennium and SAC, central risk books have become a trend at some of the world’s biggest investment banks which have been seeking to minimize risk exposure. As Bloomberg explains, instead of dozens of workers across numerous desks working to limit possible losses, trades are transferred to a single CRB where they are managed by a small team, often with the help of complex algorithms. “Looking at isolated losses in central risk books is misleading since it does not take into account other related trading books or offsetting factors such as commissions earned,” Kerrie McHugh, a spokeswoman for Deutsche Bank in New York, said in an e-mail. She declined to elaborate on specifics. While the size of the loss was manageable for one of Europe’s top investment banks, it represents a new glimpse into Deutsche Bank’s problems both at its equities business, which has reported quarterly declines in revenue since 2015, and in the U.S., where the Fed has been scrutinizing its controls. Adding insult to injury, CEO Christian Sewing has targeted the stocks division for cutbacks since he took the top job in April. Executives at the firm started increasing the size of the CRB for the U.S. equities business in late 2016 and continued until this year, when it contained about 2 billion euros ($2.3 billion) of trades, the people said. One person said the pool contained positions in both common stock and equity derivatives, complex contracts that derive their value from shares. While CRBs are meant to allow banks to cut costs, improve profit and bolster risk management, this particular strategy floundered, partly because of issues with the CRB’s technology, the sources said, and as Bloomberg explains, one of the problems was how well the team’s algorithms analyzed the trading success of counterparties. Another source said that the CRB may also have become "too big to manage properly." Deutsche Bank executives have since shrunk the size of the CRB to about several hundred million euros, the people said. Ryan O’Sullivan, a trader who helped oversee the strategy, moved to the role of global co-head of electronic equities in May of this year, according to his LinkedIn page. Amusingly, according to McHugh, the DB spokeswoman, "he was promoted" confirming that all one needs to do to get to the top at the German bank is lose tens of millions. And so with this latest failed attempt to prove to the world that its equities trading desk is competitive now safely in the rearview mirror, Deutsche Bank can focus on what truly matters: defending itself from the upcoming accusations that it helped Russians launder - by way of Danske Bank - some $150 billion in "hot money" into the US.